Our team of experienced roofing repair technicians is always here to answer questions and help you feel confident as we take on your repair job in Newmarket. Finding a roofing company in the Newmarket, Ontario area to handle roofing repair at your home or office isn’t always an easy task. There are a number of people looking to scam you out of your hard-earned money by promising results and requiring payment up front, only to disappear when it comes time to actually do the work or to fix a job that was poorly done in the first place. Even if you find a trustworthy company or roofing professional, you might end up with shingles that don’t complement the exterior of your home or have a poor warranty that doesn’t last very long. 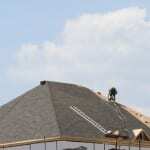 Most building owners don’t have a lot of knowledge about roofing materials, so talking about shingle options may feel like speaking another language. At Slippery Slope Roofing, our team of experienced roofing repair technicians is always here to answer questions and help you feel confident as we take on your repair job. We offer roofing repair to both commercial and residential customers in Newmarket, so if you have any questions or would like to talk about different options, we are happy to oblige. We also guarantee complete satisfaction on every job we take on, which is why we offer our own 10-year warranty on the workmanship. One aspect that sets us apart from others in the industry is our commitment to each individual customer. We don’t juggle multiple roofing jobs at once, which allows us to focus completely on your job and results. Contact us today to schedule a consultation if you suspect that your structure may be in need of roofing repair.